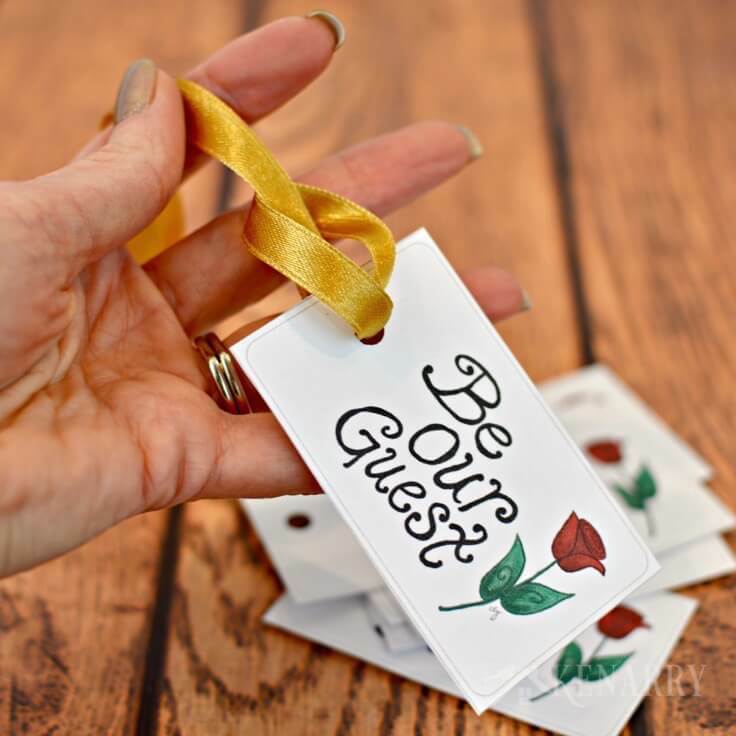 Be Our Guest free printable tags are great Beauty and the Beast party favors for a Disney themed wedding, birthday party or for a guest room. It’s the day I’ve been waiting for all year — the new live action Beauty and the Beast movie from Walt Disney Studios opens in theaters TODAY! 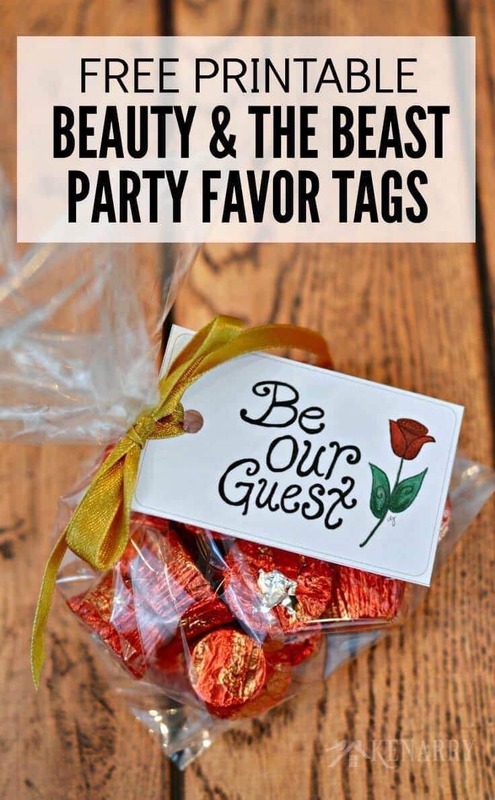 To celebrate, I created Be Our Guest tags as a free printable you can use to make Beauty and the Beast party favors for your Disney themed wedding, a Disney princess birthday party or even to welcome people who stay in your guest room. The year was 1991. I was a junior in high school, still feeling the insecurity of my awkward middle school years. Though I’d shed my braces and replaced my coke-bottle thick glasses with contact lenses, I still felt a little nerdy on the inside. With long brown hair, you’d often find me curled up on the weekends absorbed in a VC Andrews novel or some other book I couldn’t possibly put down. When the Walt Disney Studios released the original animated version of Beauty and the Beast that fall, I COULD NOT WAIT to see it. At last there was a Disney Princess that I could personally relate to! Belle wasn’t a princess by birth nor did she hold any royal or noble title. She was the daughter of an inventor from the village. This brunette heroine was just an average or even peculiar girl “with a dreamy, far-off look and her nose stuck in a book.” She was smart, clever and beautiful — all the things I longed to be known for as a young woman in high school. When she headed off to the castle to save her father, I was enchanted by her unexpected affection for the Beast and all of the lively characters she encountered. The story of Beauty and the Beast captivated me from once upon a time until the happily ever after. My love of all things Disney and especially Beauty and the Beast continued to extend throughout my adulthood. In my college years, I spent a semester working at Walt Disney World on their college program. For many years, I kept a big poster on the wall above my bed showing Belle dancing with the Beast in her gorgeous golden yellow dress. While that poster got lost somewhere along the way in my twenties or thirties, you can still see a Mickey Mouse poster on the wall in my craft room right now. You can only imagine how excited I was then when I heard that the Walt Disney Studios were going to release a NEW live action version of Beauty and the Beast! My arms were covered in goosebumps when I saw the official trailer they released last November. It showed just a glimpse of the Disney magic that was going into creating this masterpiece. I was so giddy that I could hardly stand the excitement and anticipation. I started mentally counting down the months, then the days until now. The new Beauty and the Beast movie opens around the country in theaters TODAY! 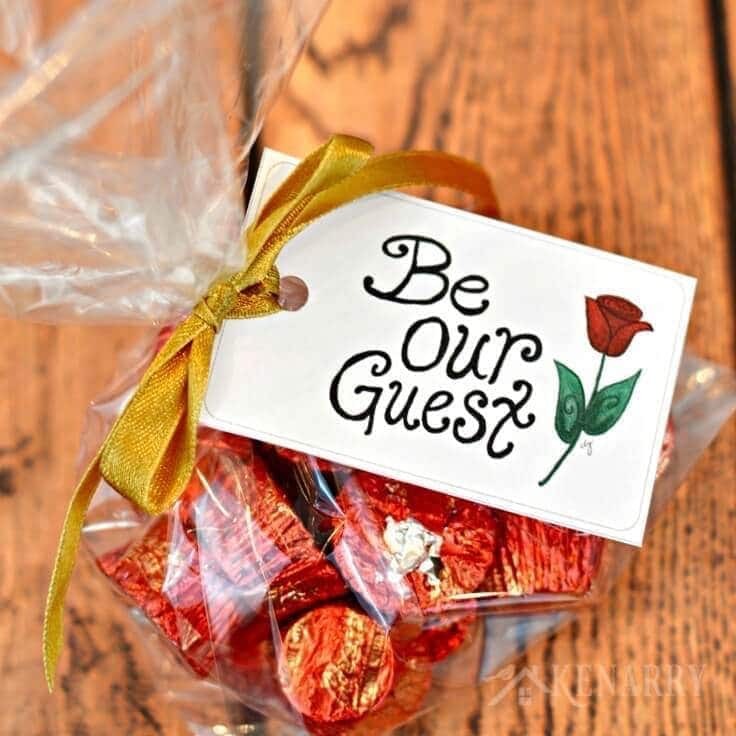 To celebrate the release of the new live action version of my favorite Disney movie, I created a little “Be Our Guest” tag with a single red rose. They were designed to be attached to Beauty and the Beast party favors for a Disney themed wedding, a Disney Princess birthday party or to be used any other creative way you can imagine. 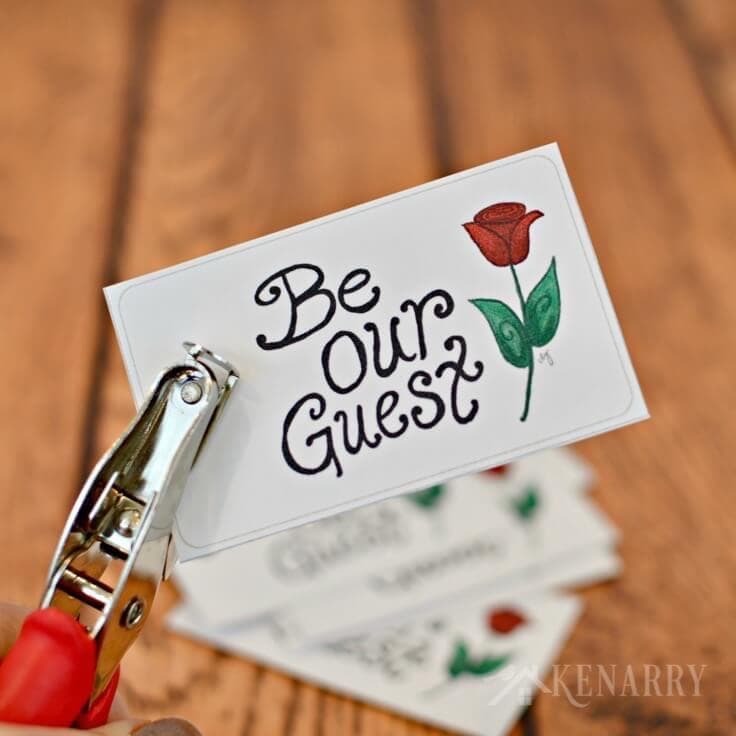 If you want these “Be Our Guest” tags for your own Beauty and the Beast party favors, they’re available as a FREE digital download exclusively from Ideas for the Home by Kenarry™. These “Be Our Guest” tags work great to welcome people to your magical Disney themed wedding. Tie them to candy or trinkets if you’re hosting a Disney princess party for your daughter’s birthday. Or you can even attach them to a water bottle or small gift to give overnight visitors who stay in your guest bedroom. However you choose to use them, please know we’re sharing the free printable for your personal use only. 1. Get the tags for the Beauty and the Beast Party Favors. The printable Beauty and the Beast party favor tags are available as a FREE gift when you sign up below! Then you just need to download the PDF file and save it to your computer. 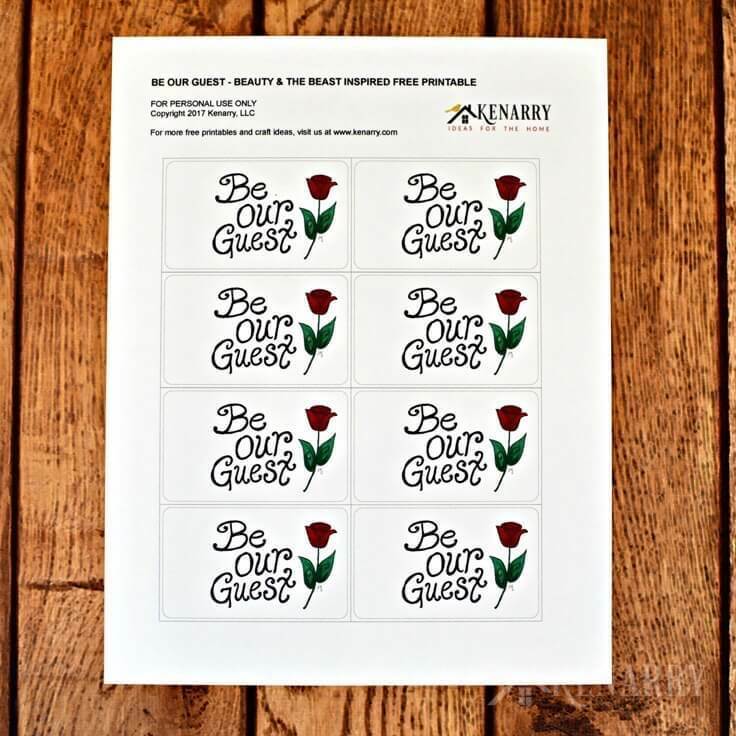 The Beauty and the Beast party favor tags and all other free printables from Ideas for the Home by Kenarry™ are for your own PERSONAL USE ONLY. Once you have the file, print the tags for the Beauty and the Beast Party Favors on white card stock. 2. Cut and punch the tags for the Beauty and the Beast Party Favors. 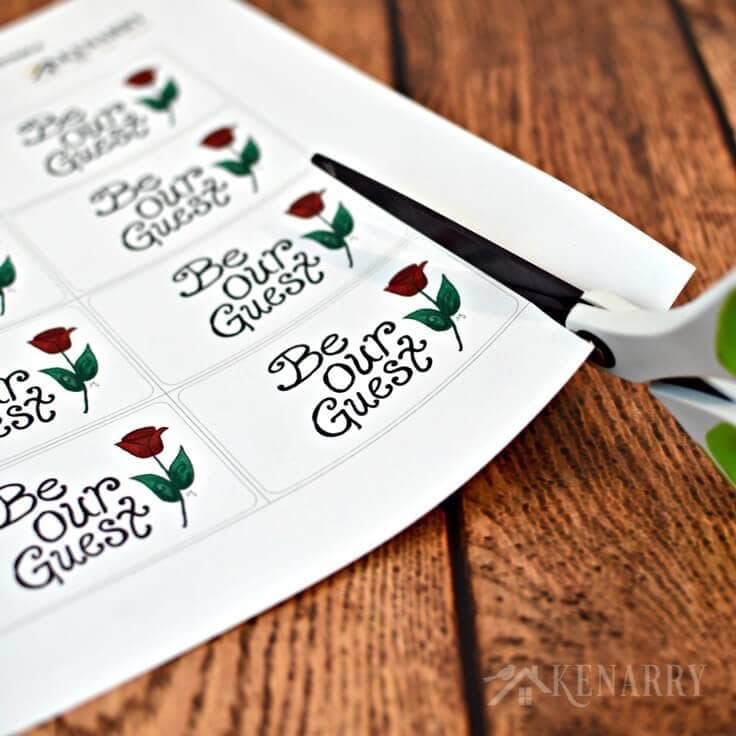 Use scissors to cut along the lines between each of the “Be Our Guest” tags. If you want straighter lines, I’d suggest using a paper trimmer. Next, use a simple hole punch to put a hole in the side or the upper left corner of the tags so you can tie the tags onto the Beauty and the Beast Party Favors. 3. Fill the cellophane bags with treats. 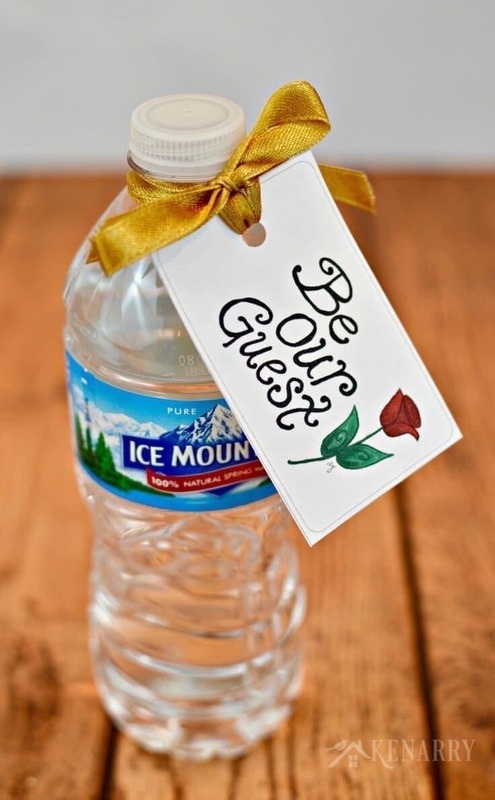 Gather the candy, water bottles or other trinkets you wish to include in the Beauty and the Beast party favors. Put one of each item into a cellophane bag. Then continue to do so with the remaining bags until you have filled enough for your wedding, your child’s class or birthday party guests. 4. Tie the tags on the Beauty and the Beast Party Favors. Cut the ribbons to the size you need, making sure you have enough for curling or tying (whatever your preference is). I used a satin gold ribbon because it reminded me of Belle’s dress in that iconic scene in the ballroom when she falls in love with the Beast. Lace the ribbon through the hole in the Be Our Guest printable tags. Next tie the ribbons around the top of each cellophane bag. If you’re making these Beauty and the Beast party favors for a young child’s birthday party or class treat, you may want to tie the knots loosely. Small children don’t have the fine motor skills or patience for tough knots. Alternately, you could also tie these tags to water bottles, wine bottles, juice boxes or some kind of small trinket or gift to welcome guests to your event. One of these rose petal craft ideas might be especially fun to make as Beauty and the Beast party favors. 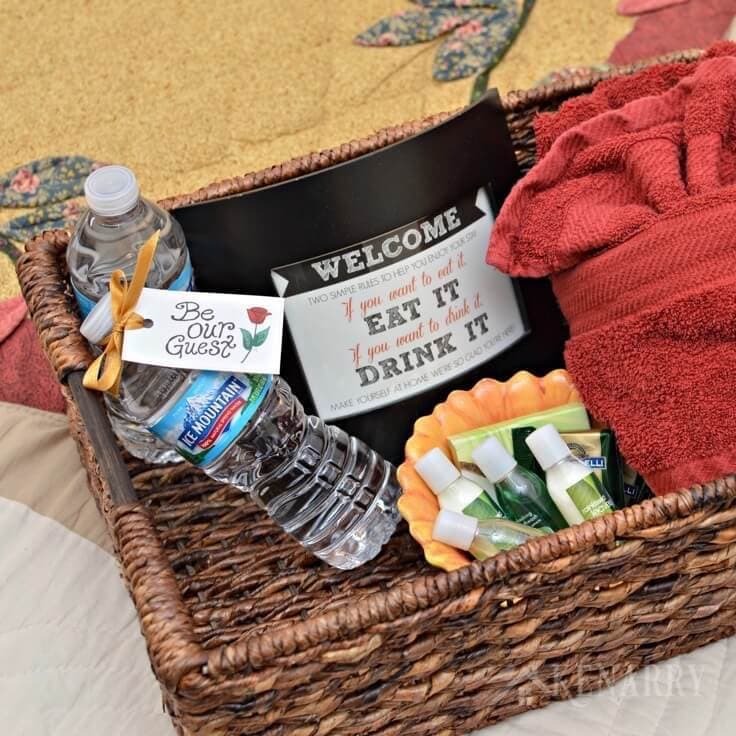 I actually tied ours to water bottles and used them in the basket in our guest room where we keep bath towels, chocolates and other amenities to welcome family and friends who stay with us. The colors in the “Be Our Guest” tags go perfectly with the small welcome sign I already had in the basket as you can see in the photo below. 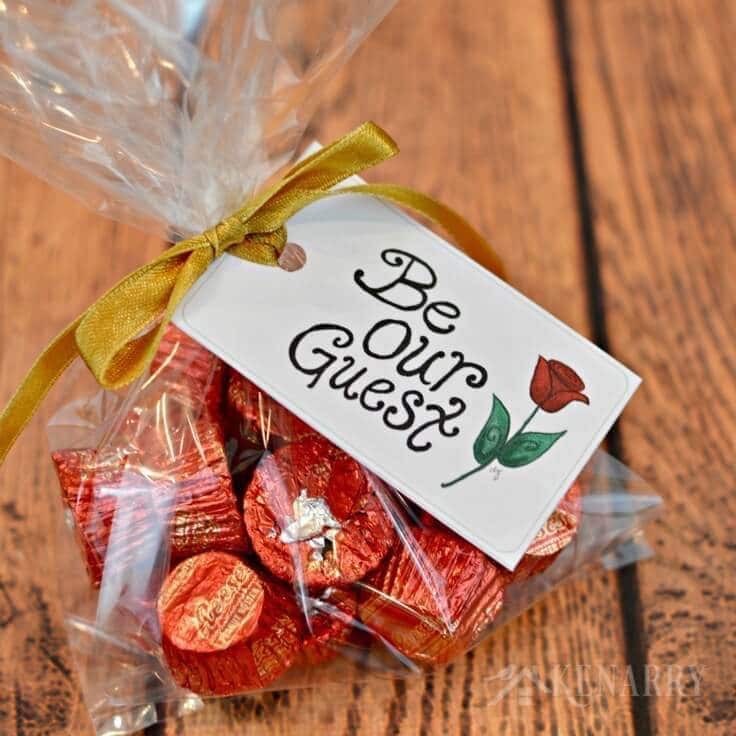 Now you have a special treat or gift that will truly make people excited to be your guest at your wedding, Beauty and the Beast birthday party or in your home. What other creative ways do you welcome people at your events or when they come over to see you? Please comment below and share. We’re always looking for new ideas! If you’re a bride-to-be, you might like this tutorial for how to etch wine glasses or these ideas for how to turn your flowers into keepsakes. Hi! I’ve subscribed but can’t seem to find where to download the printable. Could you direct me to the download? These are super cute! I’m so glad you think these tags are super cute! I just sent you a direct e-mail with the link to where you can download the printable. Let me know if you didn’t get it. Thank you so much for subscribing! As soon as you subscribed, you should have gotten a link to the Idea Insider Resource Library. Once you go to that web page, you’ll find the Beauty and the Beast tags about half way down the page under the heading “Birthday Printables“. If you still have trouble finding it, let me know! 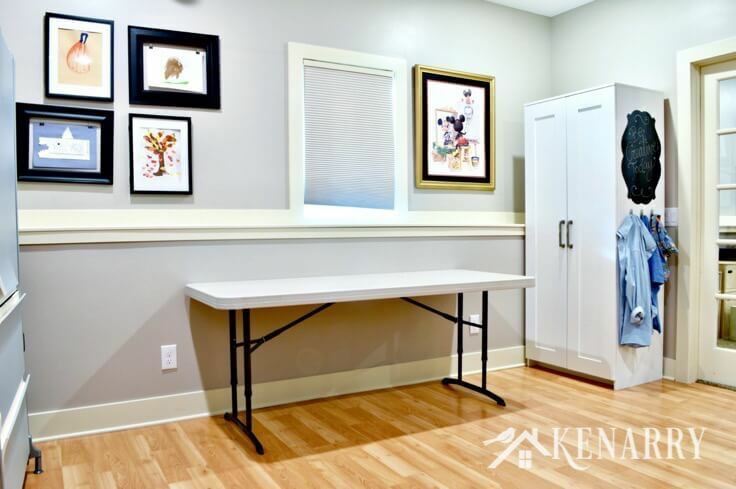 Thanks so much for subscribing and choosing to be a Kenarry Idea Insider! I would love to print these for my daughters up coming birthday. But I’m unable to find the link. If you’ve already subscribed, check your inbox for an e-mail from me with the subject line “Thank You + Your Free Printable” — that e-mail message contains the link to the Idea Insider Resource Library. You’ll find these tags under the “Birthday Tags” category as you scroll through the library. Thank you again — and enjoy planning your daughter’s birthday party! I love these! I subscribed last night but haven’t received an email confirmation yet. Is there something additional I need to do? Hi Tanya, I’ll e-mail you and we’ll get this figured out! Hi! I’ve subscribed like three times and confirmed the email but can’t seem to find where to download the printable. Could you direct me to the download? I like the Be our guest with a rose since my name is Rose. Hey Rose, right after you confirmed, you should have gotten an e-mail in your inbox with the link to our Idea Insider Resource Library where you’d find the tags. I just followed up and sent you a direct e-mail with the links you need to download the tags. I apologize for the confusion! Let me know if you didn’t receive it. Hi! I too received my email for subscribing but can’t seem to find where I can download the pdf to download these, is there a way you can show me where to download them? Thank you for subscribing! I’m so glad you got our email confirmation. In that message just click on the link that says to go to the Idea Insider Resource Library. It will open up a special exclusive web page and you’ll find these tags about half way down the page under Birthday printables. If you still have trouble finding it, please let me know and I can help direct you further.